Photo by Bryan Stevens • An Eastern towhee feeds on the ground beneath a feeder. I’d almost given up on any new birds arriving to break the daily monotony of birds in my yard when two birds put in their first appearances of the year. An Eastern towhee and a Northern flicker both showed up simultaneously for the first time in 2017 on Jan. 13. The towhee, a male, was feeding in the usual manner of its kind, scratching vigorously on the ground beneath my feeders. 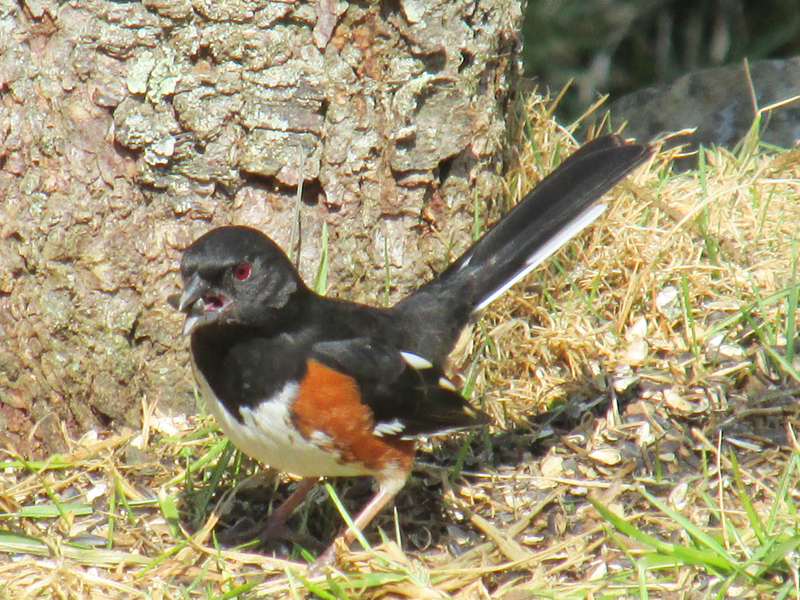 Towhees are quite ingenious at uncovering any seeds dropped by other birds. Photo by Jean Potter • A Northern flicker perches on a staghorn sumac. The flicker was calling from the upper branches of a very tall tree at the edge of a wood lot near my home. The ringing calls of the flicker carried quite clearly even from a distance. Most woodpeckers, including the Northern flicker, are enthusiastic performers. We often think of woodpeckers in association with loud, repetitive drumming with their beaks against the trunk of a tree. Flickers are also known for using other surfaces for drumming. I’ve observed flickers drumming agains metal utility poles and metal siding on homes. That’s really not so strange when you consider that the purpose of the drumming is to communicate with mates or to signal potential rivals that they’re getting a little too close. 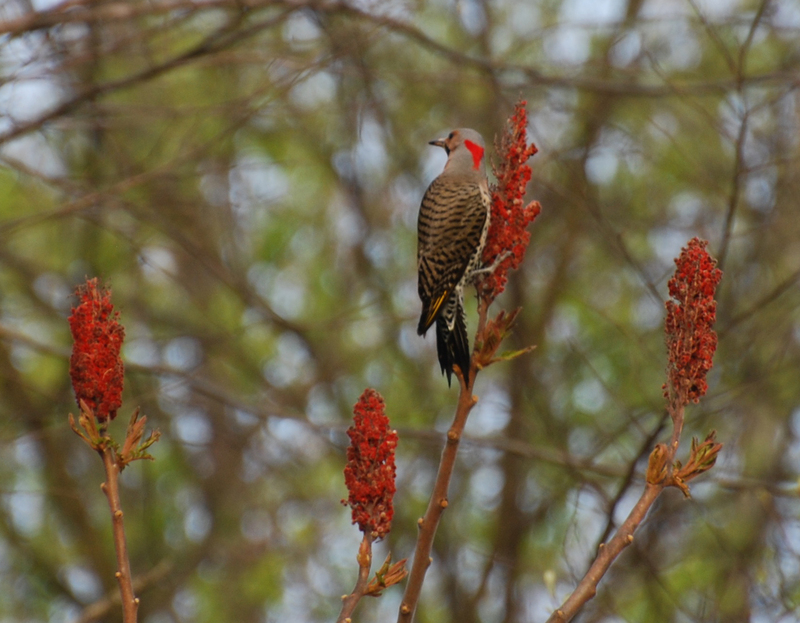 Woodpeckers are also known for a variety of vocalizations, and the Northern flicker is no exception. In addition to drumming, the flicker also employs a variety of loud vocalizations that are fairly distinctive. A loud, repeated flicker, often translated as “wicka-wicka-wicka,” is similar to the cluck-like call of the larger pileated woodpecker. The flicker is also known for emitting a sharp, loud “kleeer” call can be heard from a considerable distance. It was this “kleer” call that first drew my attention to the presence of the flicker at my home on Jan. 13. Flickers are probably most vocal during the spring months. They go quiet for a period during the summer nesting season but start to make themselves heard again during the fall months. A warm, sunny day during the winter is often motivational enough to convince flickers to vocalize. Photo by U.S. 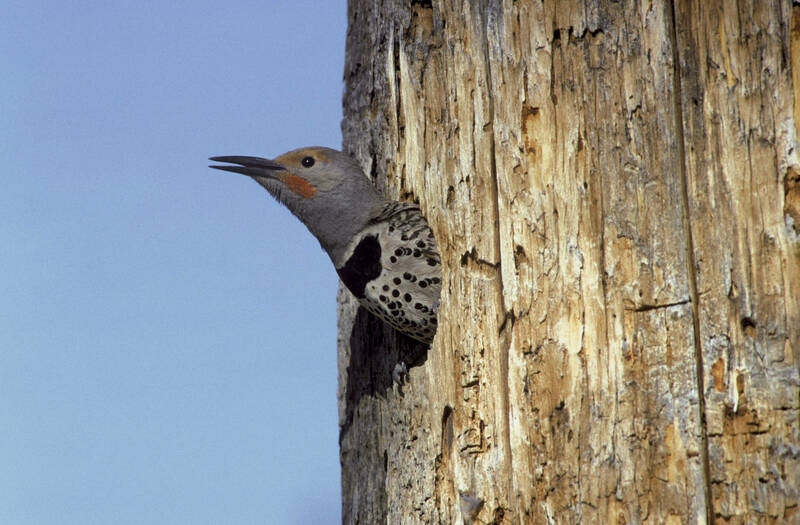 Fish & Wildlife Service • A Northern flicker peers from a nesting cavity. A lot of wildlife is probably getting mixed signals thanks to the extremely mild January temperatures. For instance, I’ve already had a few crocuses blooming in my gardens. Bees and other pollinators have also awoken from winter slumber to take advantage of the unseasonal blooms. If frigid weather does eventually arrive, I hope that these “early birds” suffer no ill effects. The Northern flicker is the second-largest woodpecker in the region. The only bigger member of the family is the large and unmistakable pileated woodpecker. The flicker ranges across the United States and Canada. The flicker is also present in Central America, Cuba and the Cayman Islands. Known scientifically as Colaptes auratus, which can be roughly translated as the “golden woodpecker,” there are about a dozen species of flickers in North, Central and South America, as well as the Caribbean. In the United States and Canada, flickers in the eastern half of the continent are known as “yellow-shafted” flickers. The phrase “yellow-shafted” describes the Eastern race of this woodpecker, which is replaced in the western United States by the “red-shafted” flicker. In reality, both the yellow and red-shafted birds are considered by experts to be the same species. The yellow feathers in Eastern birds are found under the wings and on the tail. The yellow, or red, sections of the wings are most visible when the bird is in flight. I’ve seen both forms of this woodpecker, observing the red-shafted form during trips to Utah in 2003 and 2006. Although most people think of woodpeckers as spending most of their time clinging to the trunks of trees, the flicker actually has something in common with the Eastern towhee. Like the towhee, the flicker spends a lot of time on the ground hunting for its favorite food — ants. The flicker even has a special adaptation — a barbed tongue — that it uses to capture ants. Photo by U.S. 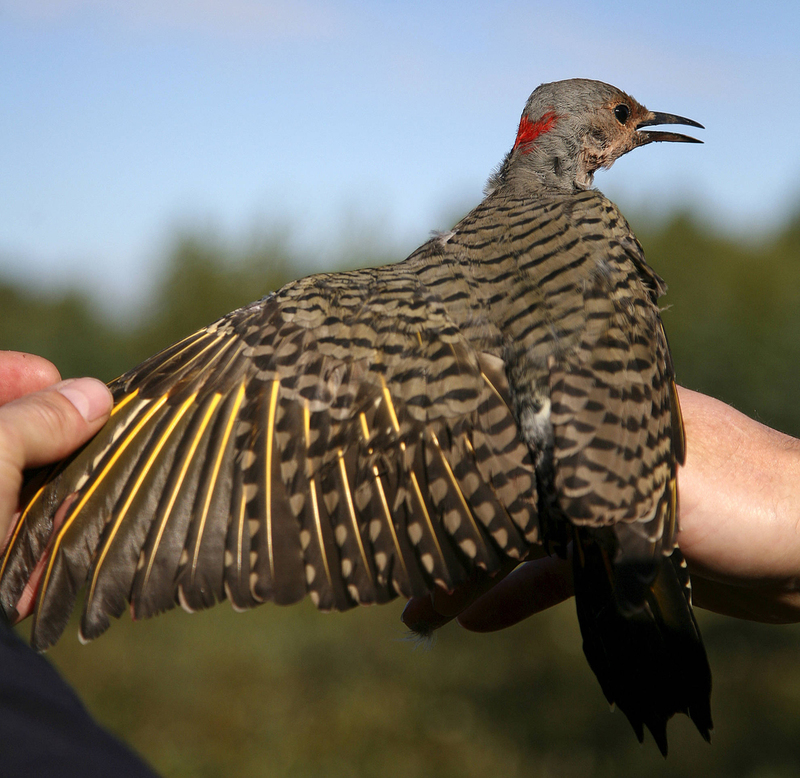 Fish and Wildlife Service • A Northern flicker, captured for a banding operation, has its wing extended to show the yellow feathers indicative of the eastern race of this species. Flickers will come to feeders, but I’ve never had much luck attracting them. Perhaps I’ve not offered the right fare. The late John V. Dennis recommends “meat scraps, cracked walnuts and pecans, halved oranges and apples, and white bread” in his book, “A Complete Guide to Bird Feeding.” Even Dennis acknowledged that flickers are, at best, wary visitors to feeders. Not much has changed since Dennis wrote his book back in 1977. If any readers have had success luring flickers to their feeders, I’d love to hear their advice for attracting them. The flicker has even been recognized as an official state bird by Alabama. Of course, Alabama officially bestowed the recognition on the “yellowhammer,” a nod to a nickname for both the flicker as well as Confederate soldiers during the Civil War. Even today, Alabama is still known as the Yellowhammer State. 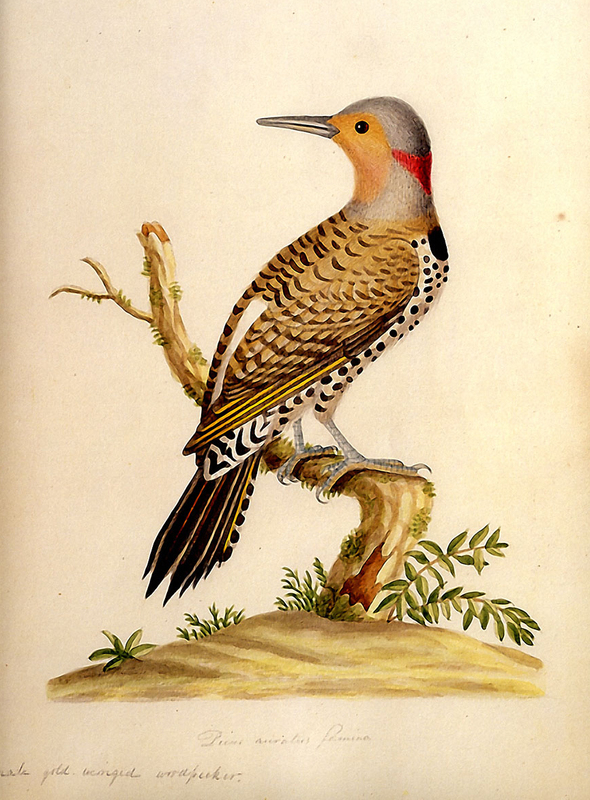 Somewhat surprisingly, the flicker is the only woodpecker that has received designation as a state bird. This entry was posted in Birding, Birds, Northern Flicker, Uncategorized, Woodpeckers and tagged Birding, birds, Bristol Herald Courier, Bryan Stevens, Carter County Compass, Elizabethton Star, Erwin Record, Feathered Friends, Feeding birds, McDowell News, Northeast Tennessee, Northern Flicker, Our Fine Feathered Friends, The Erwin Record, Winter birds, Woodpeckers on February 5, 2017 by Bryan Stevens.